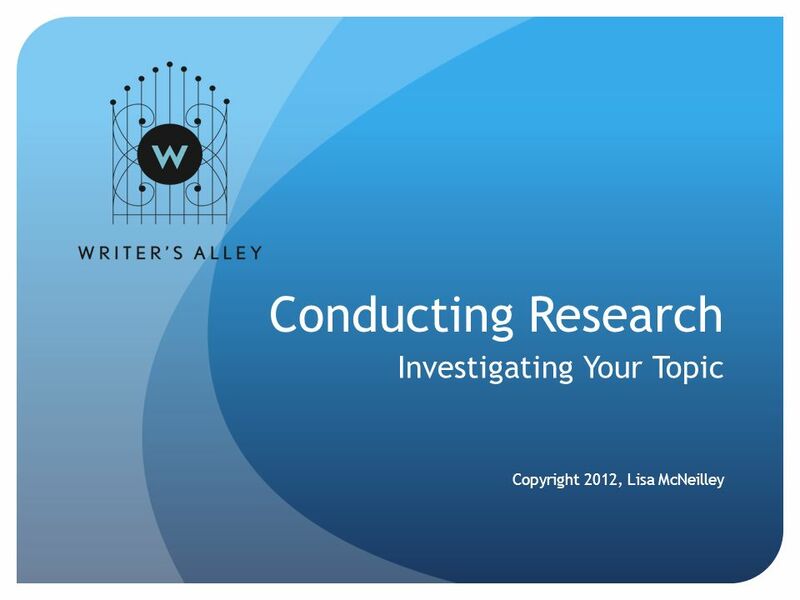 Conducting Research Investigating Your Topic Copyright 2012, Lisa McNeilley. 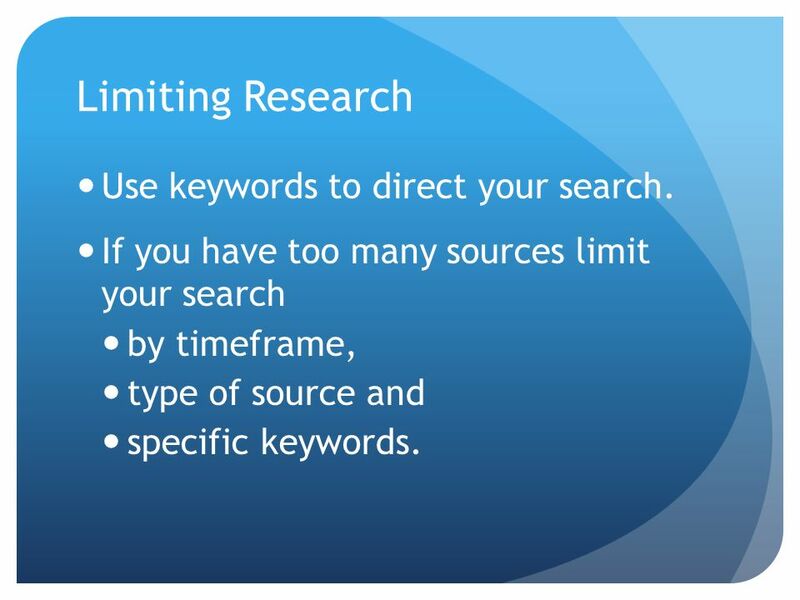 8 Limiting Research Use keywords to direct your search. 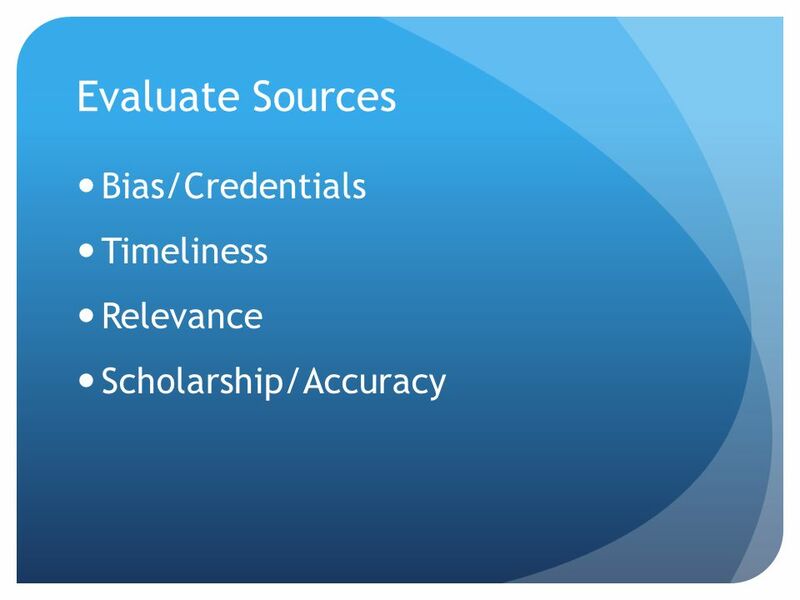 If you have too many sources limit your search by timeframe, type of source and specific keywords. 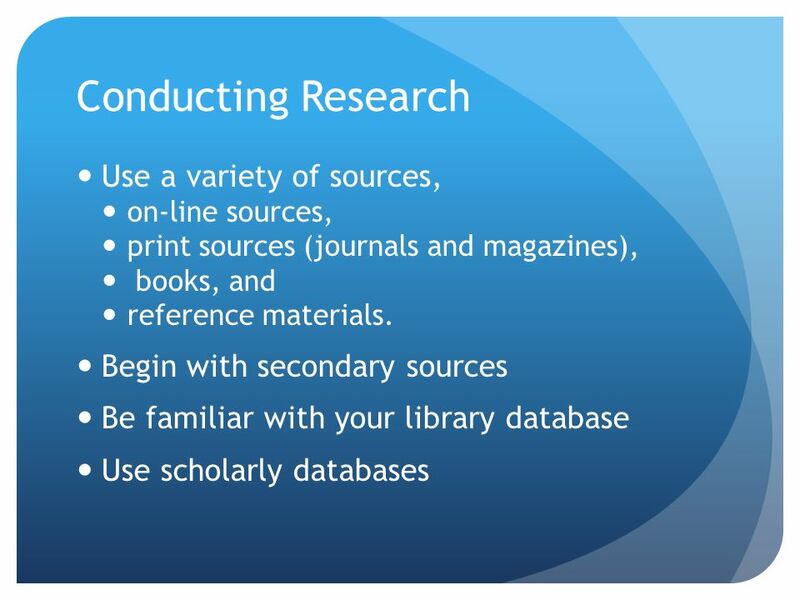 9 Your Sources Get more information by looking at the Index Table of Contents References or Bibliography Avoid dictionaries, encyclopedias, and Wikipedia at this point in your research. 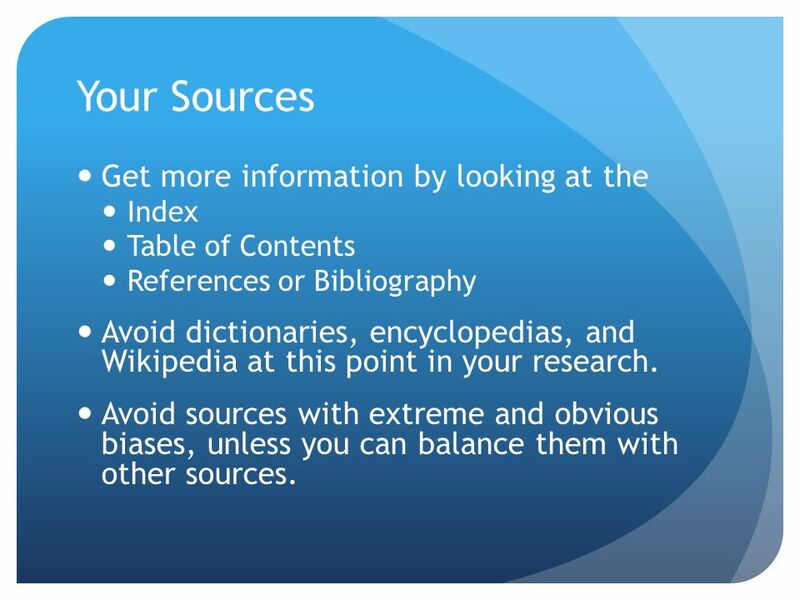 Avoid sources with extreme and obvious biases, unless you can balance them with other sources. 11 Note the writers purpose and main idea(s). 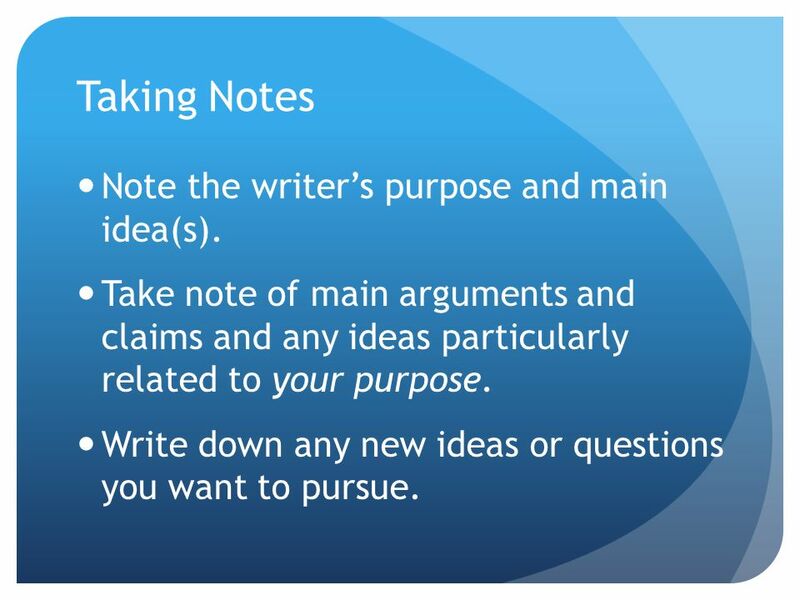 Take note of main arguments and claims and any ideas particularly related to your purpose. Write down any new ideas or questions you want to pursue. 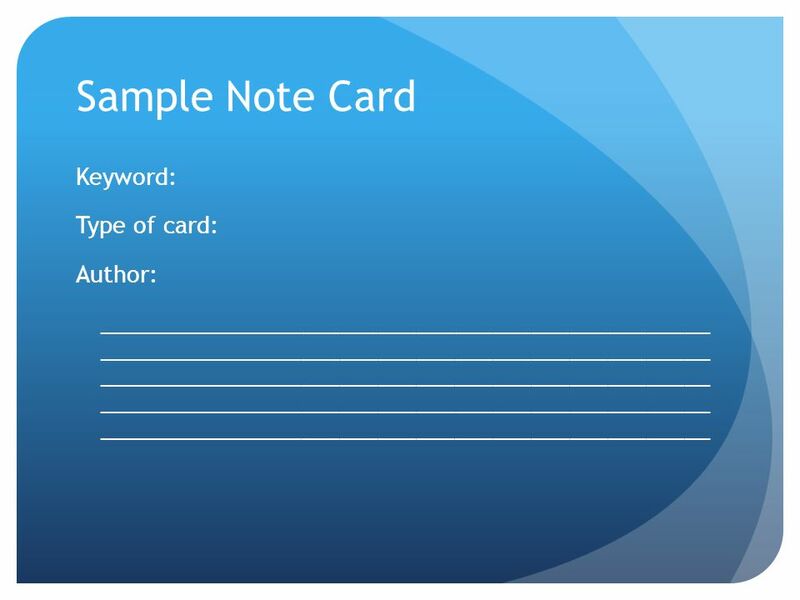 12 Taking Notes, contd Write each idea on one index card and include: a heading in the form of a key word or phrase, the authors last name and the page number of the information (for use in citation in the paper), the type of card: Quote, Paraphrase, Question, or Own Idea. 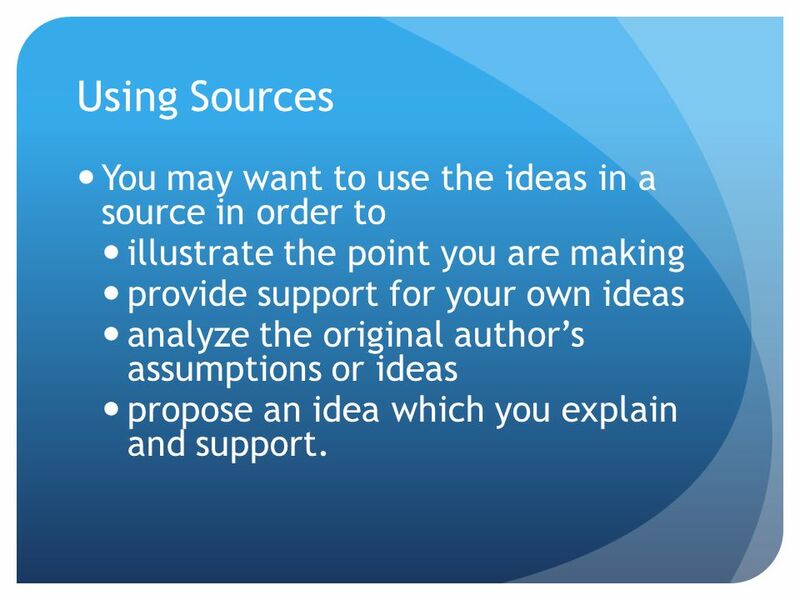 17 Using Sources You may want to use the ideas in a source in order to illustrate the point you are making provide support for your own ideas analyze the original authors assumptions or ideas propose an idea which you explain and support. 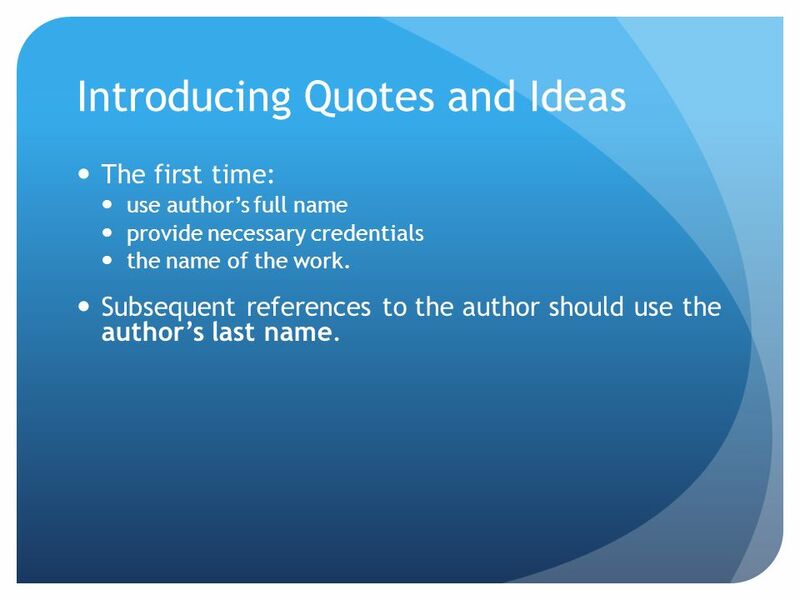 21 When to Use Quotes You want to analyze the wording or ideas of the author. 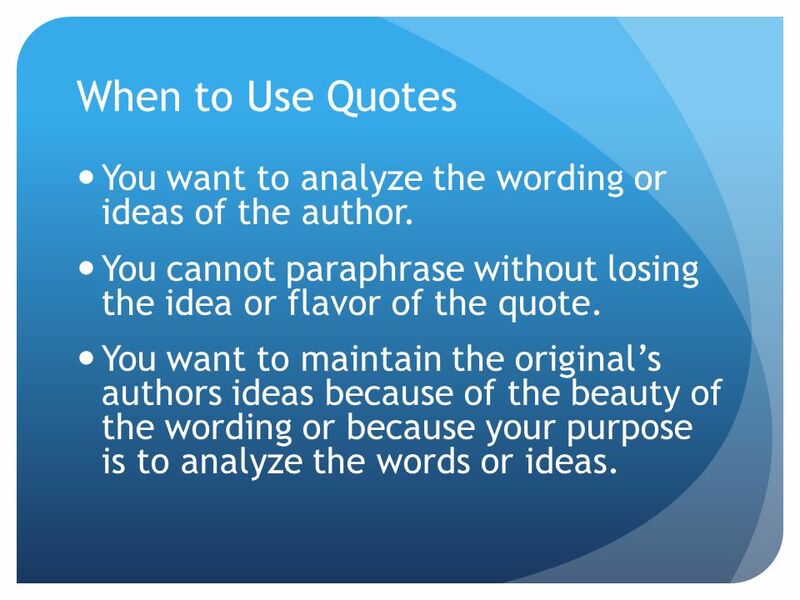 You cannot paraphrase without losing the idea or flavor of the quote. 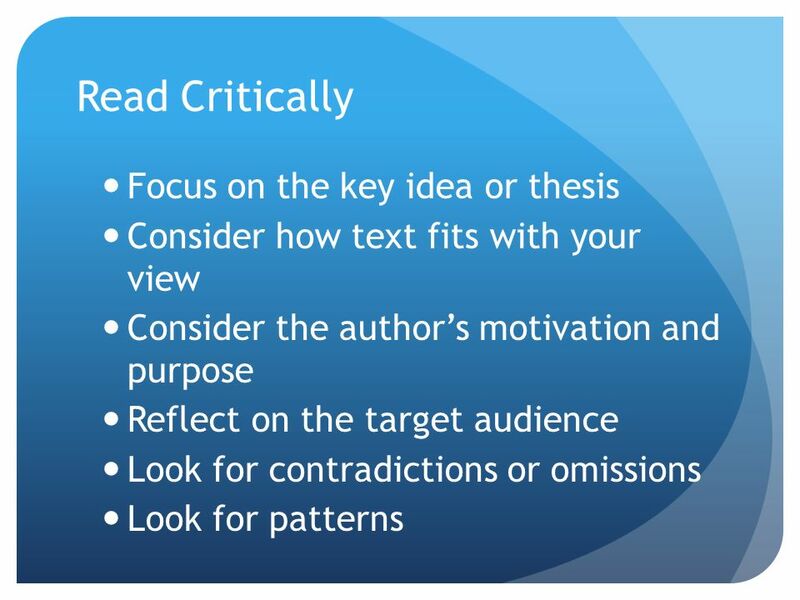 You want to maintain the originals authors ideas because of the beauty of the wording or because your purpose is to analyze the words or ideas. 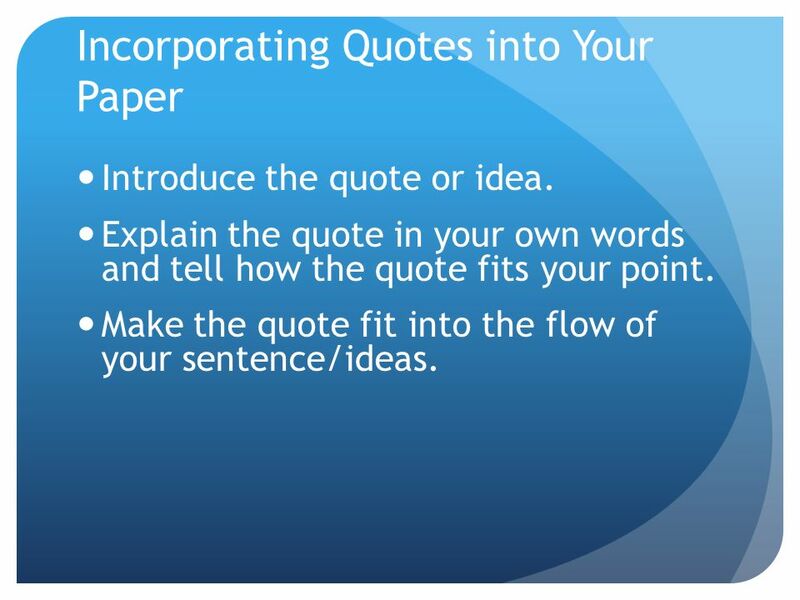 22 Incorporating Quotes into Your Paper Introduce the quote or idea. 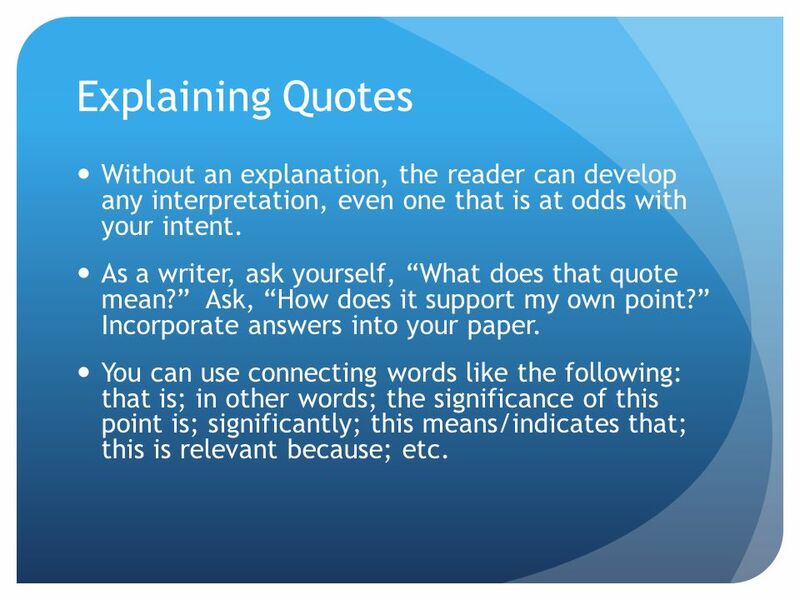 Explain the quote in your own words and tell how the quote fits your point. Make the quote fit into the flow of your sentence/ideas. 23 Introducing Quotes and Ideas The first time: use authors full name provide necessary credentials the name of the work. Subsequent references to the author should use the authors last name. 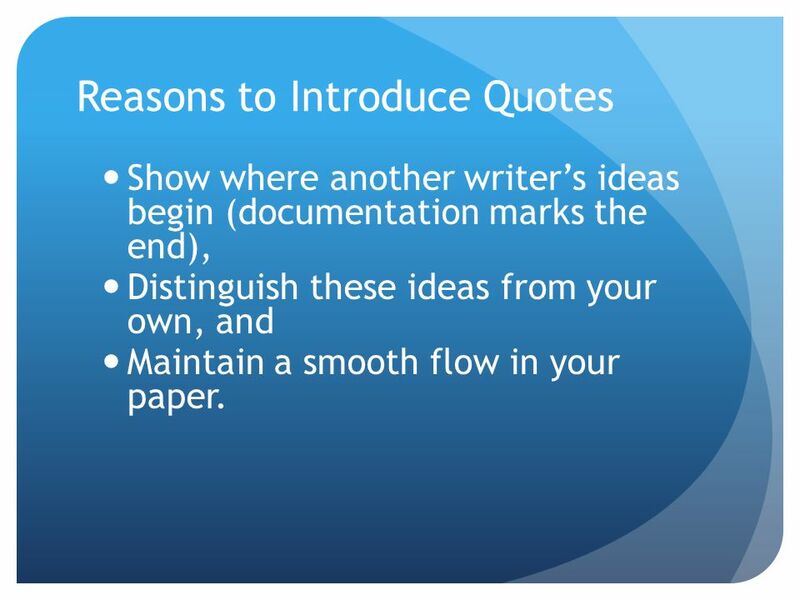 24 Reasons to Introduce Quotes Show where another writers ideas begin (documentation marks the end), Distinguish these ideas from your own, and Maintain a smooth flow in your paper. 26 Explaining Quotes Without an explanation, the reader can develop any interpretation, even one that is at odds with your intent. As a writer, ask yourself, What does that quote mean? Ask, How does it support my own point? 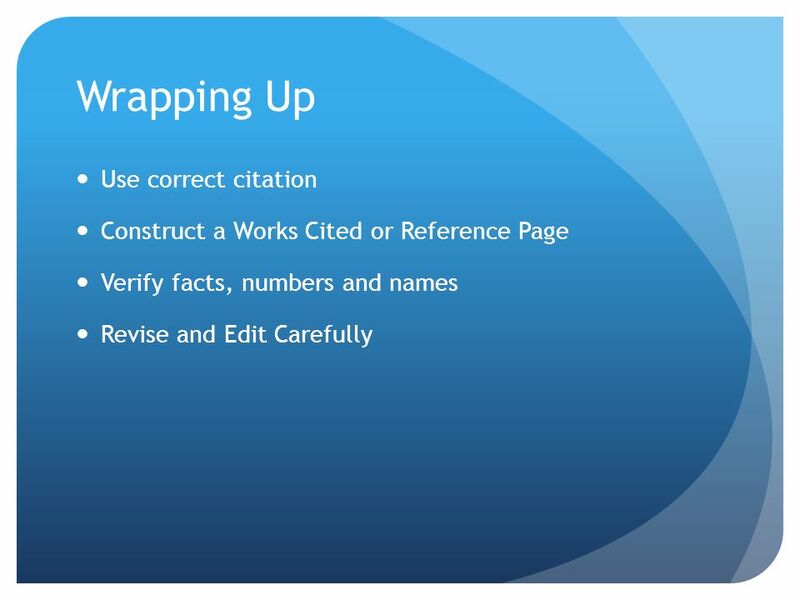 Incorporate answers into your paper. You can use connecting words like the following: that is; in other words; the significance of this point is; significantly; this means/indicates that; this is relevant because; etc. 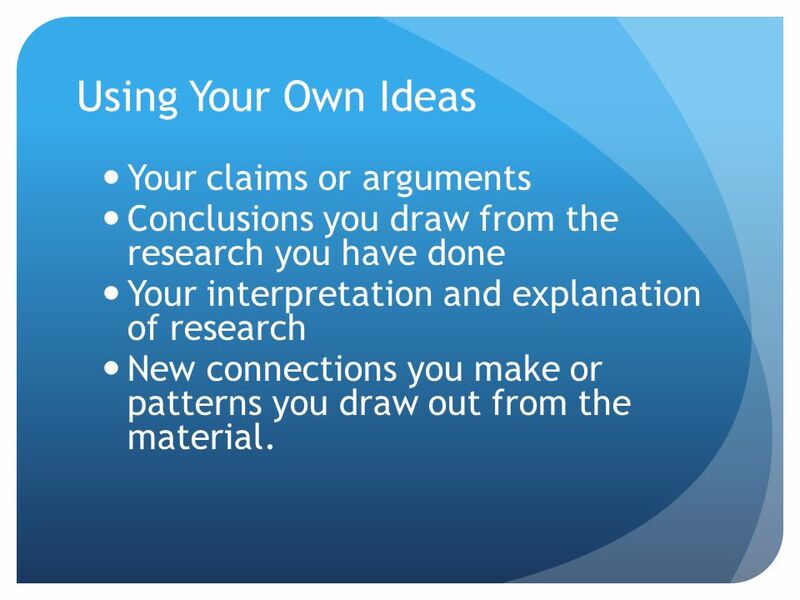 27 Using Your Own Ideas Your claims or arguments Conclusions you draw from the research you have done Your interpretation and explanation of research New connections you make or patterns you draw out from the material. 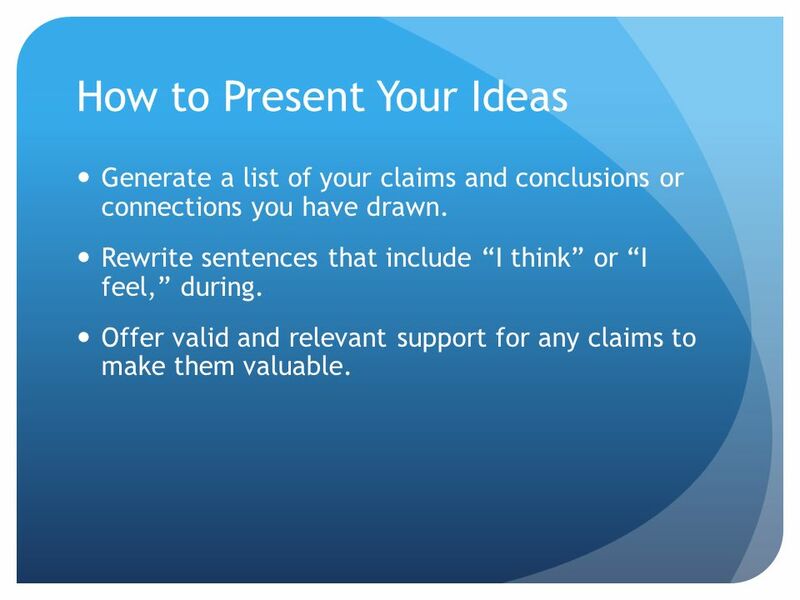 28 How to Present Your Ideas Generate a list of your claims and conclusions or connections you have drawn. Rewrite sentences that include I think or I feel, during. Offer valid and relevant support for any claims to make them valuable. 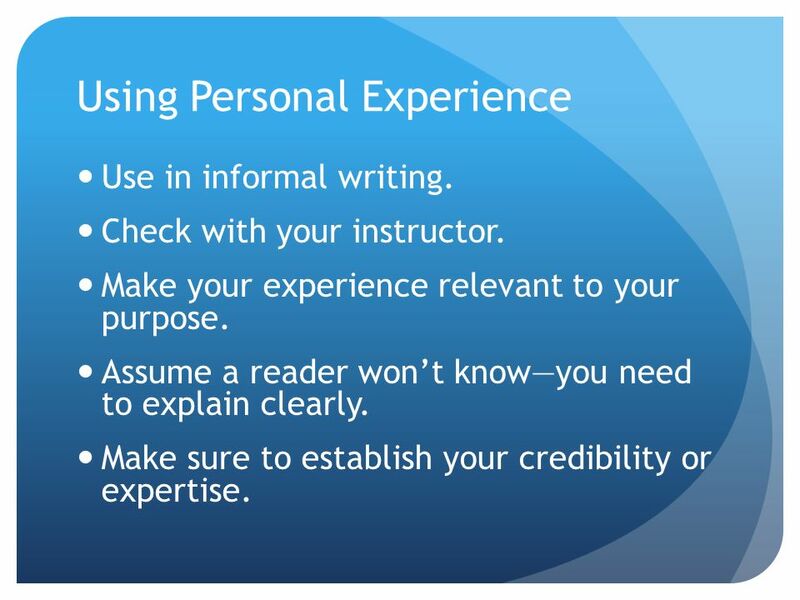 29 Using Personal Experience Use in informal writing. Check with your instructor. Make your experience relevant to your purpose. Assume a reader wont knowyou need to explain clearly. 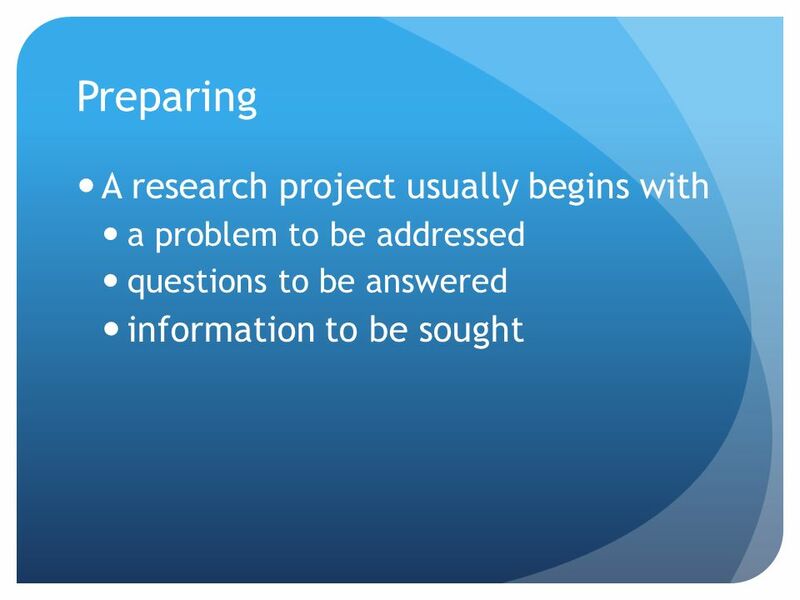 Make sure to establish your credibility or expertise. 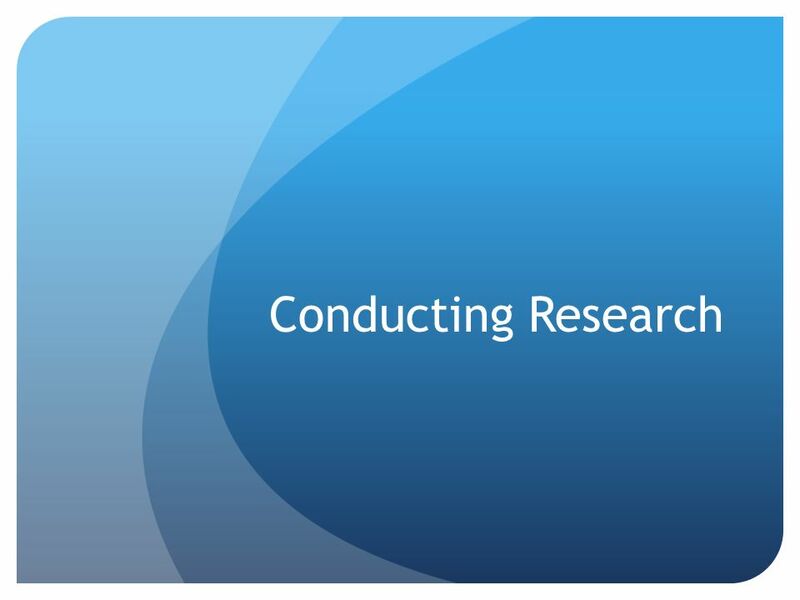 Download ppt "Conducting Research Investigating Your Topic Copyright 2012, Lisa McNeilley." 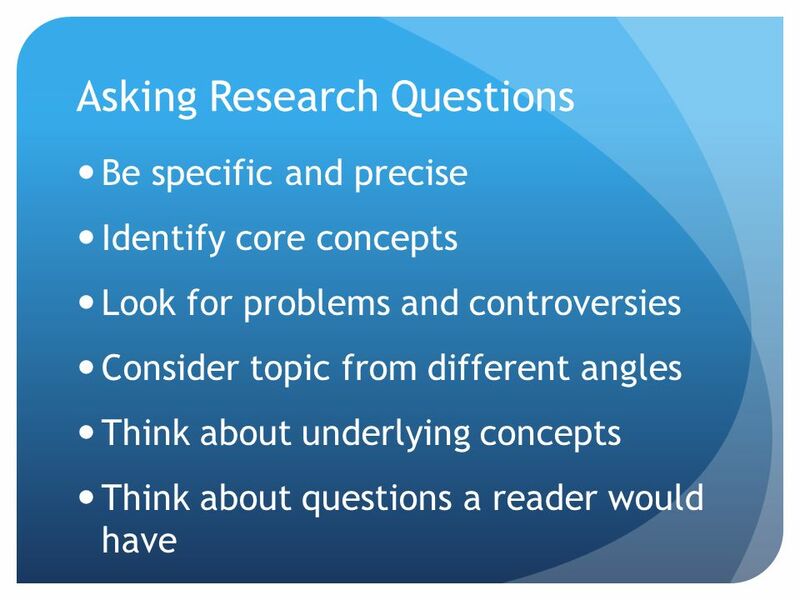 Integrating Sources into Your Writing University Writing Center Jaclyn Wells. 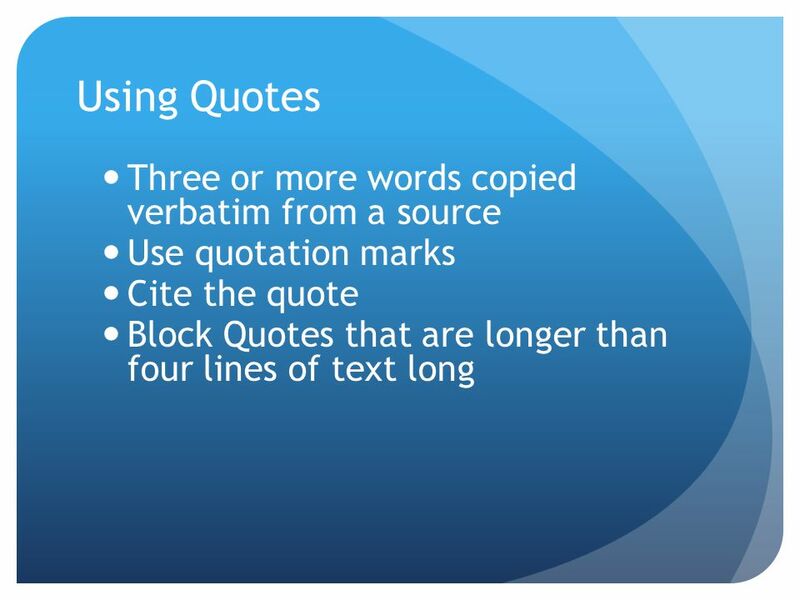 Textual Evidence Integrating Quotations into Paragraphs. Tentative Unit 1 Schedule Week 2 1/19- MLK Day-No Class 1/21-Using library databases (bring computer to class) 1/23- Intro to Exploratory Narrative & Source. Copyright © 2002 by Pearson Education, Inc., publishing as Longman Publishers. All rights reserved. Professional Communication: Strategies for College. 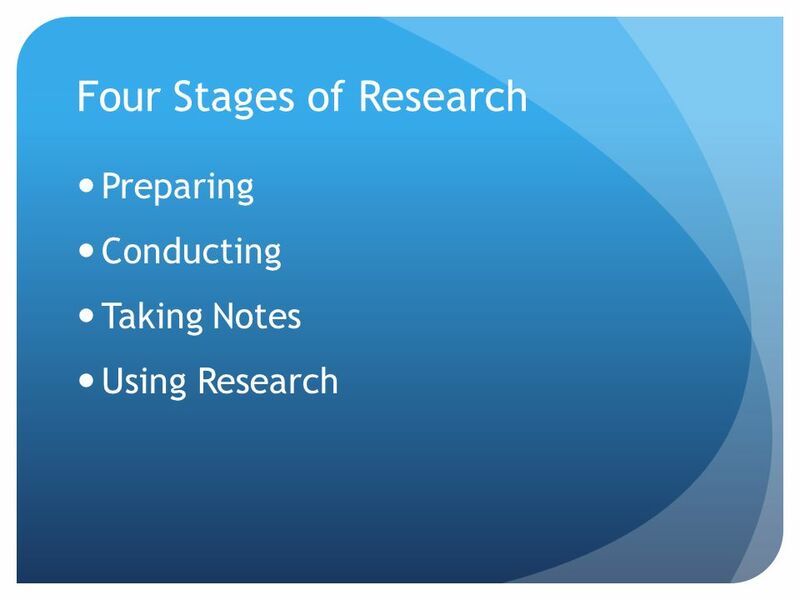 The UNA University Writing Center Writing & Research Process Workshop Series Dr. Robert T. Koch Jr. Director, University Writing Center University of North. C HAPTER 5 Writing the Research Paper. C OMING U P WITH A T OPIC What are you interested in? Do you have a unique perspective on something? What would.  Do I know my topic for research? (Do I have my topic chosen before I get on a computer? If not, I have to make that decision and write it down first. 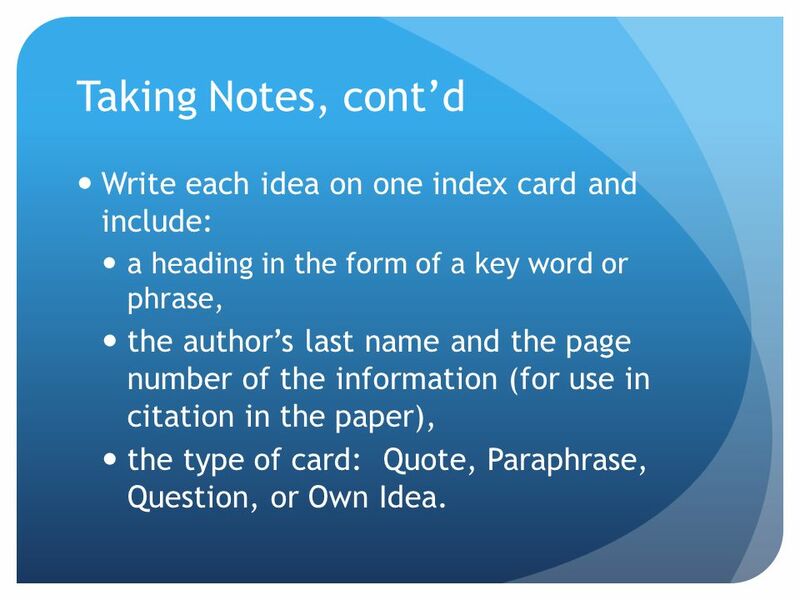 TKAM: Introduction to Research Quoting, Paraphrasing, Summarizing Note Cards & Bibliography. PARAPHRASING BORROWING LANGUAGE AND IDEAS. 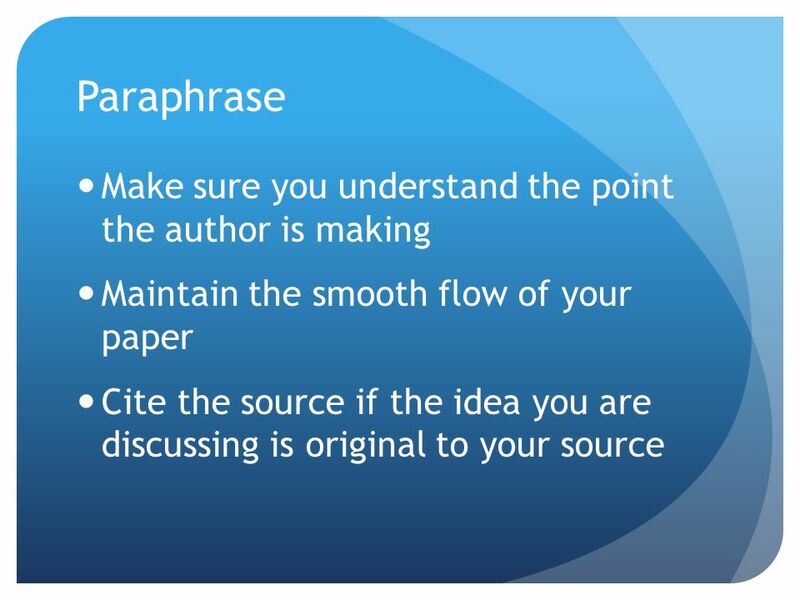 WHAT IS A PARAPHRASE? 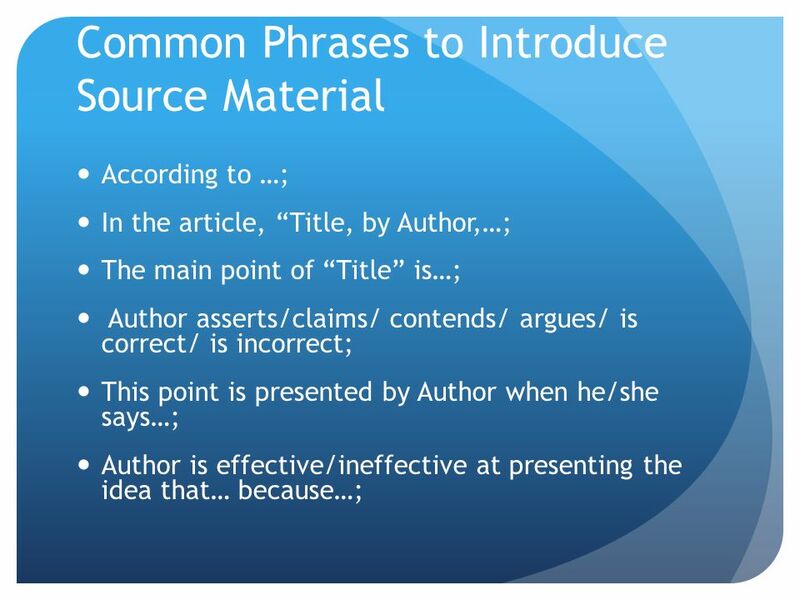 WHAT IS A PARAPHRASE? 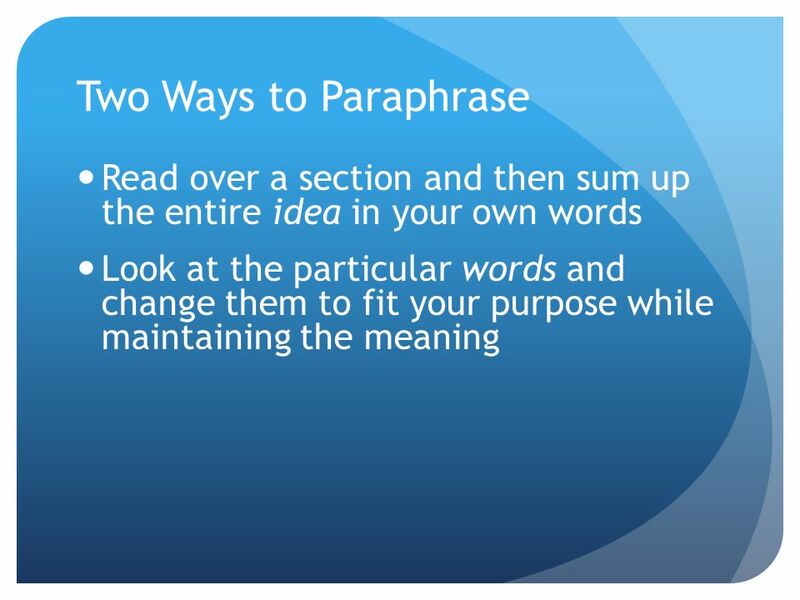 DEFINITION: Paraphrasing is when we borrow ideas, language, or. Librarian pre-selected a variety of scholarly and popular journal articles.